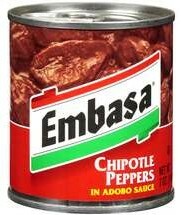 It used to be my least favorite ingredient to use in a recipe was Chipotle Peppers; not because I dont love them, because I do, but because I got tired of opening a can, using just one or two peppers and throwing the rest away. Then one day I was watching Rachael Ray and she shared this fabulous little tip Stop throwing away partial cans of Chipotle Peppers in Adobo Sauce. Simply freeze the leftover Chipotle Peppers in a freezer baggie and the next time you need them, just slice off the amount you need and return the rest to the freezer. No more wasted peppers! Duh why didnt I think of that? Thanks Rachael! 3 Comments on "CHIPOTLE PEPPERS IN ADOBO SAUCE: Tip for Saving Leftovers"
I love the idea about freezing the chilis in adobo. I never wanted to open a can because I knew it would go to waste. I had looked around for several blogs that would show me what your blog ultimately have. Your blog was by far the best blog for the information because of its simplicity and easy to comprehend. Thank you for sharing! Thanks so much for your nice compliment. I hope youll try some of the recipes and let me know which are your favorites. Welcome to A Healthy Kitchen glad you found me.